Visiting Naples historical center an extraordinary open-air museum where ancient and modern merge continuously, creating the San Martino hill to the sea, a breathtaking sight that the watchful eye of the visitor will certainly seize. Dominated by the volcano “Vesuvio”, Naples is a prominent tourist destination for its charm, in fact, there are only a few cities offering so many beauties, breathtaking views to beautiful places, from palaces to museums. To visit Naples historical center means exploring twenty centuries of history. Today of ancient Palaepolis (the “old town”) just something is still surviving: the city of Greek origins has left behind a few visible traces, however, such as the Greek walls that run along Via Mezzocannone. The archaeological things from the Roman period, known as Neapolis (the “new city”) are more than the ones from the greek one. Many cemeteries, catacombs can be visited in Museums and archaeological sites of the city, including the area of San Lorenzo Maggiore which hosts a Greek agora from the 5th Century B.C. ; as well as many other ruins from the Roman era, when the city was a true metropolis. The charm of Naples is this: the signs of its magnitude which are also the signs of history are numerous and obvious and reside so much in the monuments, churches, palaces, as the character to be provincial city . Childbirth – Stendhal wrote – I will not forget neither via Toledo, nor all the other districts in Naples; in my eyes it is, beyond comparison, the most beautiful city in the universe. Our journey to discover the historic center of Naples begins with “Spaccanapoli” (because it divides the ancient city), visitors can admire the Church of Gesu Nuovo, with its facade recovered from a building of the ‘400, go to the Basilica of San Domenico Maggiore Angevin and get climbing via Duomo, the magnificent Cathedral. o not miss a visit to the Chapel of the Treasure of San Gennaro which houses, among other things, the relics of the saint’s blood. From Port’Alba and Piazza Bellini, place of literary cafes, engage yourself directly under the medieval arcades of the palace of Philip of Anjou in Via Tribunali to Castel Capuano. 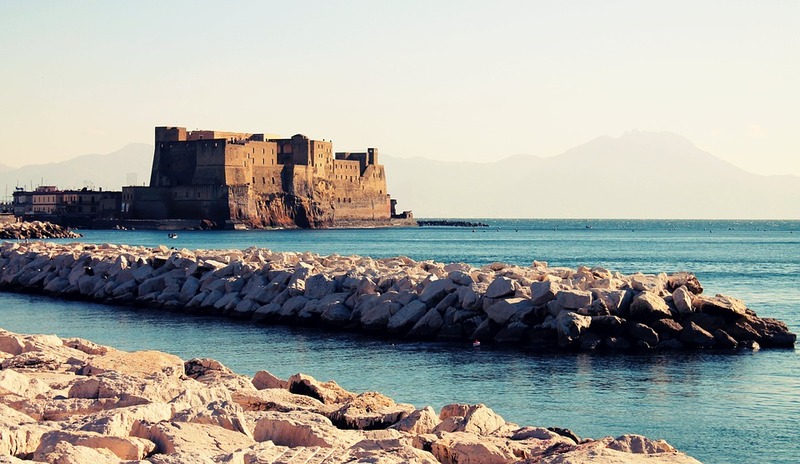 One of the four castles that dominate Naples with Castel Sant ‘Elmo, Castello dell’Ovo and the fortress-palace of Castel Nuovo, also called “Maschio Angioino”, built during the reign of Charles I of Anjou. From Maschio Angioino, the celebrated symbol of Naples, adorned with a majestic arched entrance in marble, you arrive in Piazza del Plebiscito where you find the Palazzo Reale, the seat of many dynasties that dominated the city and the elegant neoclassic church of San Francesco di Paola. Other buildings worth to be visited are the Monastery of St. Chiara, with the beautiful decorations of the cloister of the Poor Clares, San Lorenzo Maggiore, that preserves testimonies of greek-Roman structures in the cloister, Royal Palace of Capodimonte, with the National Galleries collecting works by Titian, Raphael, Correggio, Masaccio, Mantegna and Caravaggio and various museums including the Museo Civico Gaetano Filangieri. I and his premises are teeming with life in the evenings, when Naples becomes the city of the university, of musicians, pizza and good company.